Given that today is actually the Christian holiday Easter, it only makes sense that a major movie franchise would post a cool little Easter Egg of their own, right? Well, that's exactly what Jurassic World has done, using a special viral to reveal what may ultimately be a hint at a possible Jeff Goldblum cameo in the upcoming summer blockbuster. When captured using a smart phone's barcode scanner, a link is generated that sends you to an image of a book called "God Creates Dinosaurs"... which was written by none other than Dr. Ian Malcolm - the iconic chaos theory-loving mathematician character played by Jeff Goldblum in both Jurassic Park and The Lost World: Jurassic Park. 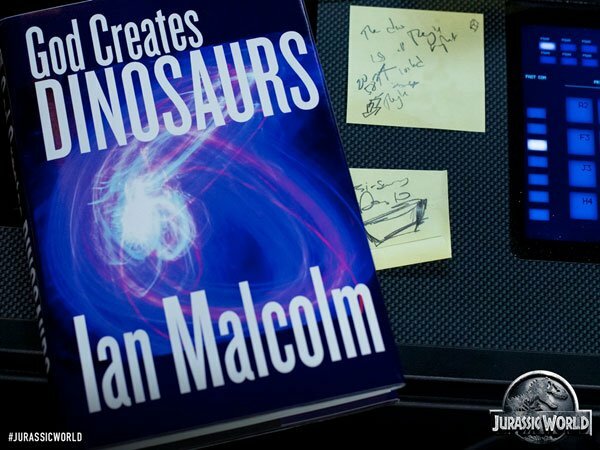 As fans will recognize, the name of the book actually comes from one of the many memorable lines from the first Jurassic Park, with Goldblum saying, "God creates dinosaurs. God destroys dinosaurs. God creates man. Man destroys God. Man creates dinosaurs." Of course, Laura Dern's Dr. Ellie Sattler winds up finishing his thought, retorting back, "Dinosaurs eat man. Woman inherits the earth." Given the very obvious set-up as a literal Easter Egg, this has to be a tiny indication that Jeff Goldblum might actually make an appearance in Jurassic World, right? Of course, we expect the film to largely focus on the new characters played by the likes of Chris Pratt, Bryce Dallas Howard, and Vincent D'Onofrio, but I can just imagine audiences erupting in applause at the sight of an older Dr. Ian Malcolm wandering through the various exhibits in the theme park. Of course, I imagine that the character will be incredibly anxious and completely ready for everything to go extremely wrong - just because he's seen it all before. Do you think that this could be a sign that Jeff Goldblum will be making an appearance in Jurassic World, or do you think the viral marketing team behind the movie is just having a bit of fun? Tell us what you think in the comments, and if you have any thoughts on those weird Post-Its, feel free to let us know.